Jobu reviews the Yankees tussle in the Bronx with the boys from Toronto. I always like this type of series. The Yankees were hosting the last place (although that’s mostly due to how good the division is, and a ton of injuries) Toronto Blue Jays. I like these series because, when the Yankees are for real, they should pound teams like these. A good division winner should sweep series like this. That being said, this often creates the “trap game” scenario, where the team you should pound nine times out of ten plays you tough and steals a game or two in a series. This time around, the Yankees took care of business and put the Jays in their place (last place) by crushing them 18-4 in a three game sweep. Skadoosh! Whether it should have been or not, this game was actually a very good pitcher’s duel until the very end. The Yankees sent Phil Hughes to the mound to open up his second half, and the Jays countered with young Henderson Álvarez, a promising rookie who was actually up for some time last season. I say this game shouldn’t have been a pitcher’s duel because the Jays and Yankees feature two of the best offenses in the league, Hughes has trouble with the long ball at times, and Álvarez is a contact pitcher who doesn’t throw all that hard. Fooooooooled Youuuuuuuuu! This game was tied at two until one yoooooge hit late in the game, and the Yankees got the win, and the opening salvo! It’s hard to say what kind of game Hughes had. On the one hand, he only gave up four hits. On the other hand, one was a home run and three were doubles. This means that, while he didn’t make too many mistakes, the mistakes he did make got pounded. The home run was hit by Adam Lind (who has come back from his demotion swinging a pretty hot bat) in the top of the fourth. The doubles, two by Edwin Encarnación and one by Rajai Davis, were sprinkled throughout the game, although one of Encarnación’s doubles scored the second Blue Jays run in the top of the sixth. It would be nice if those four hits had been singles, but far be it for me to complain about a final line that looked like this: 7 Ip, 4 H, 2 R, 3 BB, 4 K, 106 pitches and a no-decision. Hughes pitched well enough to win, and we’ll take seven innings and two runs any day, especially against the Jays offense. With the game tied after seven, the Yankees stuck to their formula, and David Robertson pitched a scoreless eighth. Cody Eppley gave up a couple of dinky hits, which got him a quick hook in favor of Rafael Soriano. Soriano allowed one of the inherited runners to score (albeit on an error by Dewayne Wise), but hammered down his 23rd save in 24 chances. Shirt untucked. Yankees win. As I said in the intro, the Yankees didn’t do much against Álvarez in the first six innings of this game. The youngster kept the Yankees off balance by using a snail’s pace (seriously it was like on nintendo when too much was going on on the screen and everything got all choppy and slow) and a good mix of pitches to rack up six Ks. He gave up an opposite-field home run to Russell Martin (total Yankees stadium cheapy) in the second inning, and back-to-back doubles to Alex Rodríguez and Robinson Canó in the bottom of the third, and that was pretty much it. The Yankees did walk four times and put nine men on base total against Álvarez, but couldn’t break through. They also came up empty against Chad Beck in the bottom of the seventh, but would not be denied in the eighth. The eighth inning was a great example of how the Yankees should be beating teams. Curtis Granderson grounded out to start the frame, but A-Rod singled and moved to second on a passed ball. Canó reached when Kelly Johnson couldn’t throw him out on a grounder up the middle (Johnson ran the ball down though, which saved a run). Jays manager John Farrell countered with Jason Frasor (who I’m pretty sure has been on the Jays since 1987), who immediately hit Mark Teixeira to load the bases for Raúl Ibañez. Ibañez got ahead in the count 3-1 and, with the bases loaded, Frasor tried to sneak a fastball by him inside. Big mistake. Ibañez took one of the hardest swings I’ve seen him take this season (he certainly doesn’t get cheated) and crushed a ball deep into the night. 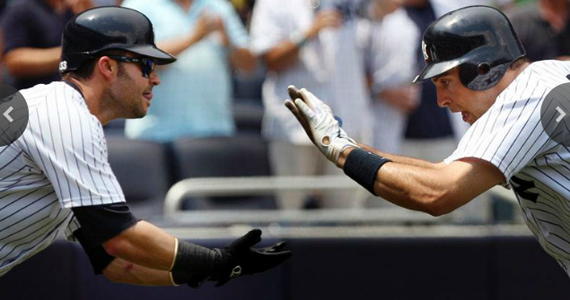 It landed in the second deck for a grand slam, and the Yankees led 6-2, which was the ballgame. After the dramatic win in game one, the Yankees needed an easy win in game two… well, at least I needed one. That’s pretty much what they got in game two. They didn’t do much off of Brett Cecil, but that wasn’t the story coming into the game. 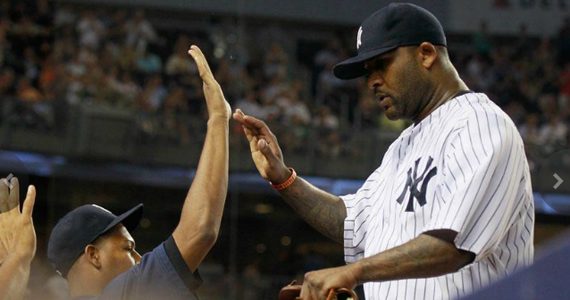 The big story was the return of CC Sabathia from the DL. The Big Lefty™ had been out for a couple of weeks with a groin injury. He returned with possibly his most dominating performance on the season, and they Yankees held off a late charge by the Jays to win the game. I really missed CC Sabathia. I don’t mean while he was injured. We haven’t seen that dominant ace since maybe August of last season, and I was starting to get a little sad about it, to be honest. CC gave us exactly what we expect from him. He went out and shut down a powerful offense like they were the Mariners or the Padres. There’s not really much to write about here, because the Blue Jays got nothing, other than a few hits, through the first six innings. HIs final line looked like this: 6+ Ip, 4 H, 0 R, 1 BB, 6 Ks, 87 pitches and his tenth win of the season. We’ll take that every time, please. I don’t think I’ve done a good job of conveying just how good Andruw Jones has been for the Yankees this season, but he wasted no time in putting his stamp on this game. Canó led off the bottom of the second with a single (to extend his hitting streak to 20 games) and Swisher walked, which brought up Jones with a chance to do some damage. The damage was, indeed, done, as Jones mashed a three-run home run to left. It was his twelfth home run of the season in just 134 at bats. He has also homered five times in his last five starts, and that’s how to be a good part-time player. You’re not going to play every day, so make your opportunities count. As I said before, the Yankees didn’t really do much off of Cecil. After the Jones home run, they didn’t score again until the bottom of the seventh inning, and he was already out of the game. Sam Dyson opened up the inning on the mound for the Jays, gave up a single to Jayson Nix, and RBI fake double to Chris Stewart (Brett Lawrie simply missed the ball) to score Nix, and another double to Jeter that scored Stewart and the Yankees led 5-0. Jeter eventually scored on a fielder’s choice grounder by A-Rod, and the Yankees had the six runs they would end the day with. This was a big time getaway day game for the Yankees, as they were scheduled to fly all the way to the west coast after the game. It was important that this game end early so that the Yankees could fly out to Oakland in time to get a couple hours of sleep before reporting to the park for tomorrow’s game (nice schedule making, MLB). Naturally, this game was delayed 51 minutes at the start because of lightning (no rain, just lightning), but the rain stayed away from the Bronx long enough for them to get seven innings in (it was ominous and pouring in Manhattan, where I work). This worked out because it kept Girardi from putting Qualls in to blow the lead and get Soriano another save. Anyway, the Yankees sent Hiroki Kuroda to the hill in this one to face the Jay’s ace, Ricky Romero. Only one of these guys pitched like an ace though, and the Yankees won a rain-shortened affair 6-0. He’s not my Kuroda, he’s not your Kuroda… anyway, what can I say about Hiroki in this game that I didn’t say about Sabathia in game two? The Jays only mustered one real threat all afternoon. It came in the top of the seventh, when they put two men on with one out. Kuroda got Davis to hit into a force out and Omar Vizquel (yes, he’s still alive) to pop up to end the threat. Kuroda did it as he always does when he is at his best, by getting ahead and finishing hitters off with his nasty splitter. The Jays, who were without José Bautista after he hurt himself in game one while swinging, were completely overmatched. Hiroki’s final line looked like this in his rain-shortened complete game shutout (not sure if it counts): 7 Ip, 4 H, 0 R, 0 BB, 5 K, 108 pitches and his ninth win of the season (9-7). Great job, good effort. The Yankees scored six runs in each of the three games in this series, on their way to a pretty decisive, “we’re kind of a big deal” type sweep of the Jays, who are now 12.5 games out of first place. Thanks to some solid early hitting, this game was over after the bottom of the first, when the Yankees put up a four spot off of Romero, who lost his fifth straight decision. Derek Jeter opened things up with a double and Swisher singled him in for the 1-0 lead. The next batter was Teixeira, who crushed a pitch over the left field fence for his 19th home run of the season and a 3-0 Yankees lead. After A-Rod grounded out feebly, Canó and Jones hit back to back doubles for the fourth and final run of the frame. 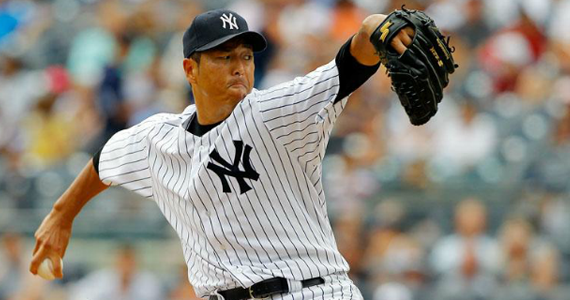 The way Kuroda pitched, the Yankees didn’t need any more runs, but what fun would that be? Wise, who for some reason got a start against a lefty, hit a ground rule double to right to score Nix in the forth, and a single up the middle to score Nix again in the bottom of the sixth. Although I admit they are playing way too much because of Gardner’s injury, Its kind of amazing how good the Yankees bench and platoon players have been this season. Ibañez, Jones, Chavez and Wise have 38 combined home runs this season, and they’ve gotten 75 RBI from the seventh spot in the order, which is often inhabited by one of those men.